Since its publication in 1561, an anonymous tale of love, friendship, and chivalry has captivated readers in Spain and across Europe. "e;The Abencerraje"e; tells of the Moorish knight Abindarrez, whose plans to wed are interrupted when he is taken prisoner by Christian knights. His captor, a Spanish governor, befriends and admires the Moorish knight, ultimately releasing him to marry his b… eloved. Their enormously popular tale was repeated or imitated in numerous ballads and novels; when the character Don Quixote is wounded in his first sortie, he imagines himself as Abindarrez on the field.Several decades later, in the tense years leading up to the expulsion of the Moriscos from Spain, Mateo Alemn reprised themes from this romance in his novel Guzmn de Alfarache. In his version, the Moorish lady Daraja is captured by the Catholic monarchs Ferdinand and Isabel; she and her lover Ozmn are forced to engage in a variety of ruses to protect their union until they are converted to Christianity and married. 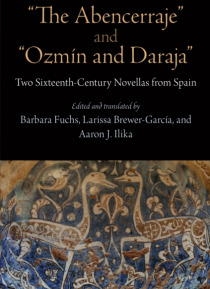 Though "e;Ozmn and Daraja"e; is more elaborate in execution than "e;The Abencerraje,"e; both tales show deep sympathy for their Moorish characters.Faithfully translated into modern, accessible English, these finely wrought literary artifacts offer rich imaginings of life on the Christian-Muslim frontier. Contextualized with a detailed introduction, along with contemporary legal documents, polemics, and ballads, "e;The Abencerraje"e; and "e;Ozmn and Daraja"e; reveals early modern Spain's profound fascination with the Moorish culture that was officially denounced and persecuted. By recalling the intimate and sympathetic bonds that often connected Christians to the heritage of Al-Andalus, these tales of romance and companionship offer a nuanced view of relationships across a religious divide.